A technology writer and computer networking expert who knows all there is to know about computer hardware. NVIDIA's response to AMD's mainstream push has lead to the rush of the GeForce GTX 1060 graphics card. In terms of performance, it falls short especially when you look at pricing. What it does do better though is space making it better suited for those with smaller cases. 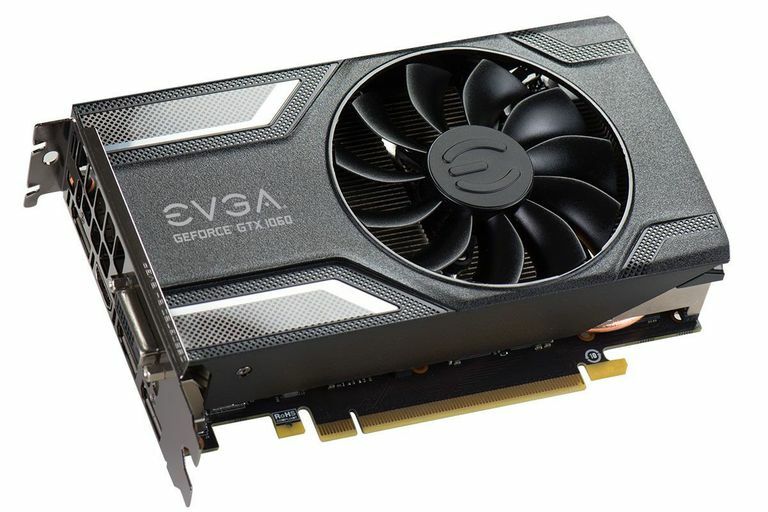 EVGA's version offers a better value than the Founder's Edition but at least it does come with the company's Step-Up program if you want to upgrade it to a fast card within 90-days of purchase. NVIDIA's new Pascal processor are certainly amazing at the high end with the ​GeForce GTX 1080 but the majority of consumers spend under $300 for a graphics card. With AMD's release of the Radeon RX 480, NVIDIA had to release a mainstream card and the GTX 1060 is it. The card is very different from the high-end end Pascal based processors, though, which has some important implications. EVGA's GeForce GTX 1060 Gaming is not a founder's card which has some advantages especially compared to AMD's new card. With the energy efficiency of the new processor, the card only requires a 400 Watt power supply and a single 6-pin power connector. The reduced power also means that it tends to produce less heat. The result is a card that is just under seven inches long which is far smaller than other cards. It is still not a tiny card though as it still is double wide in order to fit the cooling solution. It uses a more open-air design compared to the Founder's Edition design but it still does the job at keeping the card cool and running smoothly. Of course, most people just want to know how the card performs. In a direct comparison with the RX 480, it falls a bit short in a number of different games such that the RX 480 actually is a bit better. The GTX 1060 is best suited still to gaming at the highest detail levels with a 1080p resolution. It can go up to a 1440p resolution and could be compared to a NVIDIA GeForce 970 but it still falls short in the performance at this resolution as you might have to turn down detail levels to keep the frame rates high. It also does not do as well in VR gaming most likely due to the narrower 192-bit memory bus. One big ommission by NVIDIA on the design of the GeForce GTX 1060 cards though is the SLI feature. NVIDIA previously included the ability to run multiple mainstream graphics cards together to allow consumers to save a bit and still get performance to higher end cards for things like trying to do 4K Gaming. By removing this feature, NVIDIA is forcing consumers that want this feature to jump to higher level cards. So how does the EVGA GeForce GTX 1060 Gaming fare against the Radeon RX 480? The bottom line is that the Radeon RX has the advantage when it comes to raw gaming performance. The primary reason for choosing the GTX 1060 over the RX 480 right now is size and power. If you have a smaller system with a smaller power supply, the GTX has the edge but that is assuming you can find the cards and at the list price. Should You Consider Using Two Graphics Cards Instead of One?